Another CASE card. This time from Anna at (annastampincave.wordpress.com). She used different embellishments and different colors in her umbrella/sentiment, but I loved how this looked. She peeled the white backing off the White Perfect accents, and I used the Silver Metallic Enamel shapes instead. The stamps are from My Hero and Weather Together stamp sets. Thank you for looking today! I hope you have a wonderful day. Please leave a comment if you have an extra minute-I love reading them! 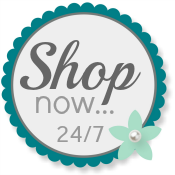 Use my Online Store for your purchase of Stampin' Up!